PBA - Barangay Ginebra survives their first “Do or Die Game” of the Philippine Cup best-of-seven semifinal series yesterday night after defeating the Star Hotshots in a blown out Game 6, 91 -67. The “Never Say Die” attitude of Ginebra proven once again in a must win situation in-front of over 18,000 crowd inside the Smart Araneta Coliseum. The Game 6 win of Barangay Ginebra tied the series 3-3 and will go into Game 7 that will decide who will be the second team to advance to the Philippine Cup Finals, facing the winner of today’s game between the San Miguel and TNT Ka Tropa in their own “Do or Die” Game 7 at Mall of Asia Arena. The Star Hotshots ended the 1st Half with a 1 point lead in a closed and low scoring Game 6 39 -38. In the 2nd Half Ginebra started to full away in the 3rd Quarter and eventually continue to the 4th Quarter that sealed the game in a blown out win for the Kings. Sol Mercado leads Ginebra in scoring with 21 points in 8 out of 10 shootings in the field while LA Tenorio added 19 points, Japeth Aguilar 11 and former Star Hotshots Joe Devance with 14 points. For the Hotshots, Marc Pingris lead in scoring with 14 points and 10 rebounds in a double-double performance, Marc Barroca also added 13 points while the lethal weapon Paul Lee was once again cut into single scoring game with only 8 points in another not so good shooting game. The Hotshots won Games 1, 2 and 5 while the Ginebra Kings won Games 3, 4 and 6. Game 7 is scheduled on Tuesday, February 21, 7pm at Mall of Asia Arena in Pasay City. Which team that you think will win in Game 7 “Do or Die”? Will the Hotshots returns back in the Finals with their new emerging superstars? Or will the Barangay manage a back to back Finals appearance? 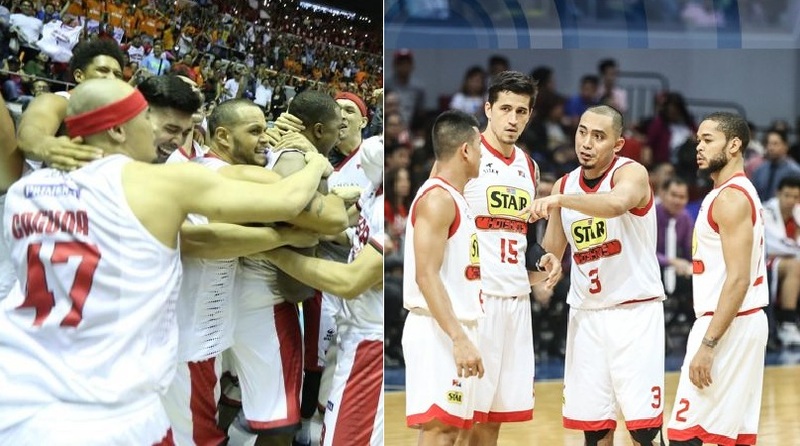 No Comment to " Ginebra Beat Star Hotshots Extending Their Series into a “Do or Die” Game 7 "